The opera house, Palau de les Arts Reina Sofia, looks like a large egg dropped from space. Barcelona, Madrid, and San Sebastian. All have been on my “must see” list for some time. Were you to ask me about Valencia; paella and oranges would come to mind. But, “perfect vacation spot”? Not so much. Oh, is it ever. Valencia is a destination with much to recommend it. Great wines, stunning architecture, parks and more. A direct flight from New York’s JFK Airport or a shuttle from Boston first, makes it easy to connect with most Valencia-bound flights. Airfare varies significantly over the course of the year, book well in advance to save a bundle. Once you’ve landed in Valencia, don’t waste precious Euros on a taxi, though they’re plentiful. The metro stop is right below the terminal and takes you into the city center in 15 minutes. Clean, smooth trains, wide enough to negotiate with large luggage flash clear signs and announce every “parada” or stop. Change money before landing however, as this rather small airport lacks a money changer. Getting around the city itself is easy. Walking will turn up unique surprises and buses that crisscross the city are easy to use. Where else can you take a bus from a major city to a beautiful beach for 1.25 euros? If your stop serves multiple buses, be sure to flag your bus as it approaches or the driver will simply keep going! Alone or with a family, Valencia offers visitors a huge array of activities from art, museums, parks, and tours. 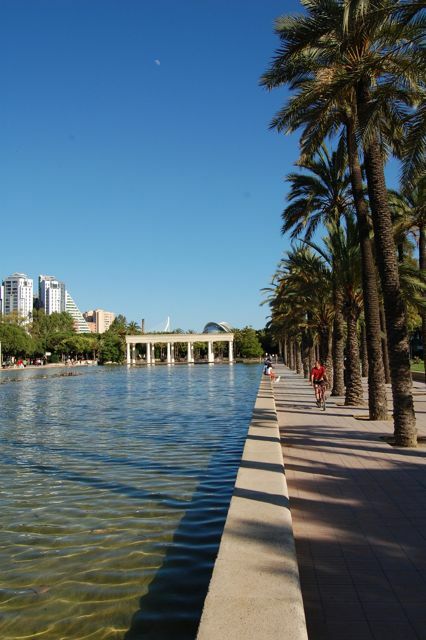 A 14 kilometer Jardin de Turia park wends its way through the city where the river that once flooded the city has been diverted and transformed. 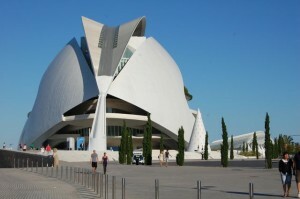 The City of Arts and Sciences is an example of the breathtaking modern architecture found throughout Valencia. The opera house, Palau de les Arts Reina Sofia, looks like a large egg dropped from space. At various times of the year you can watch bullfights or Formula One racing. Join in citywide Catholic vigils, or party with A-listers at chic clubs. Walk through the Ciutat Vella (“Old City” in the Valencian dialect) and enjoy a culinary tour of the market, or just take in the quiet side streets. Cool off with a glass of horchata or find a spot serving “Agua de Valencia” (think Mimosa). There’s definitely a cafe culture here and no one will rush you off if you linger over your jamon or espresso. Paella, the iconic dish is not to be missed, but don’t overlook Arroz al Horno, or Fideua, two culinary cousins. The wines are likely to be the biggest surprise for US travelers Drink as many as you can while here as you may have a hard time finding them back home. Outstanding, they range from very light and refreshing whites to serious French-style reds. Roses and cavas have caught international attention, too. A new generation of winemakers are turning heads and Valencians are determined to help the world discover the pleasures of their indigenous grapes such as Macabeo and Bobal. For that we say, Muchas gracias! She’s currently at work on Pig Tales: a Love Story about our love for heritage breed pigs, the farmers, chefs and artisans bringing them from farm-to-table. She is the founder of sustainable seafood workshops for chefs called Teach a Chef to Fish and has hosted an online event called Teach a Man to Fish for several years. Read more at Leather District Gourmet. 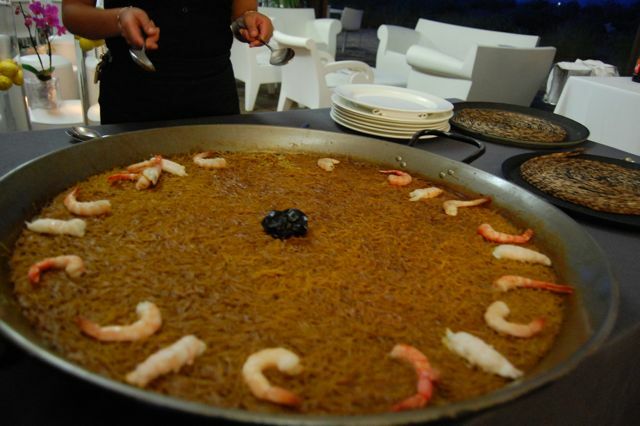 A sweet and appetizing piece of Valencia. Hope to visit the city in the future. Thanks! 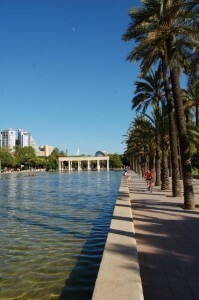 I have never been to Valencia – have been to Madrid and Barcelona, but really fancy a visit there one day! have just been in Valencia this week at a congress, and the weekend attended the tennis Open 500 and the motogp championship… wow, what an amazing city. You cant miss it!!! It’s the biggest secret of Spain, everybody talks about Barcelona, but nothing like Valencia. Fumiko – you would gobble up Valencia’s many culinary treasures. We should go explore the market one day! Ross – it’s a place with something for everyone. Mark – I couldn’t agree more. Really a hidden gem.